ON LABOR DAY 2013, WE SALUTE ALL WORKERS!! After a long hiatus, recovering from our May festival and working on plans for an even bigger and better schedule of events for May, 2014, we are proud to salute all working men and women, all over the world, who bust their butts to make our global economies run. These workers, many organized, many fighting to organize and many still not organized, get up each day and get to jobs that are often poorly paid, where workers are treated without dignity or respect. In the recent worst case scenarios, such as in Bangladesh, workers never got to return home at all! They died due to the thoughtless greed and negligence of their exploiting employers. And still these same employers plead ignorance. Labor Day is about celebrating all our working brothers and sisters and reminding ourselves that the fight is never over for fair wages, safe working conditions and dignity on the job. It is up to each and every one of us to pay attention to what is happening in our city, towns, states, country and to speak out for the rights of all workers fighting to be heard. In NYC today, there will be no Labor Day Parade and many local labor folks are upset about this. This year unions are heavily involved in a particularly contentious Democratic primary for Mayor and Comptroller, that will really dictate the direction of NYC post billionaire Bloomberg. This election takes place on September 10th, so please get out and vote! WUFF feels that it was a wise decision this year to replace the one large parade with smaller events dictated by this primary schedule. There are plenty of opportunities for large demonstrations and the NYC Central Labor Council has done a great job in organizing many fine street actions. Even more importantly, the NYCCLC was recently a co-host, with the AFL-CIO in an amazing event held in the training classrooms of UNITE in Manhattan. This full day training was the first in hopefully many more sessions in teaching union organizers, key staff and associated worker center groups how to put all the tools of social media to their advantage: Facebook, Twitter, mass email programs, social media petitions, online organizing tools. This event appeared to me to be very well attended and a tremendous success. I found the sessions filled with important and timely information and the classes were arranged to allow a nice part of the day for networking and discussion between attendees. It is just such thoughtful and successful events, though off the public radar, that will help build the future worker/labor movements. Our activists and members must be comfortable and educated in all the new technology and online tools which our corporate foes have millions of dollars to exploit. It is only through the use and careful strategy of online and offline actions (demonstrations and public actions) that we, as worker/labor activists have a good chance to reach thousands of workers who know there is something wrong with their daily struggles, but are just not sure where to turn or how to start fighting back. So my huge hats off to all thos responsible at the NYCCLC and the AFL-CIO training team for making such events happen. Steven Greenhouse, the union/labor correspondent for the NY Times and author of the excellent book, The Big Squeeze, (about how workers in the US are literally being pushed out of the middle class and into poverty by greedy corporations), suggested two excellent articles for anybody who cares about the status of labor and workers organizing this Labor Day. One is an editorial on the NY Times editorial page from August 29th, 2013, by Teresa Tritch, on the Editor's Blog. Her article points out how the whole economy would benefit from a successful fast-food worker's strike campaign: higher wages for lower wage workers translates into more dollars spent on survival by these millions of low wage workers. As Ms. Tritch points out, " Corporations benefit from the status quo. Workers don't. That's why they want a new bargain." The second article, by Jared Bernstein, zeroes in on many of the same ideas, but points out that during another banner quarter for corporate profits, wages for the vast majority of workers remained not only stagnant, but at the lowest level of increase since 1955! He goes on to say that, "something's broken when the media and economic pundits seem to devote a lot more energy to explaining why companies can't pay living wages than considering what to do about it." To Bernstein, during a period of many large corporations posting historic profits, paying a more livable minimum wage to those who receive it - 88% of whom are adults! not high school students, just makes common sense. 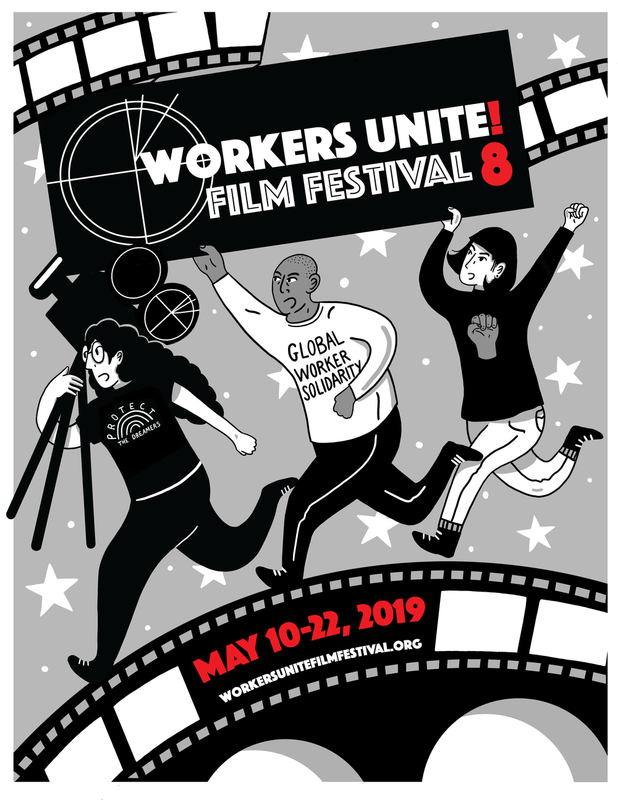 We at Workers Unite Film Festival completely agree with these thoughts and give our strongest salute this Labor Day to those brave workers, not in unions yet, who can be fired for their actions, yet willing to work off their hard to find jobs to make their points. This is where a revitalized labor movement can develop, from masses of working folks who get that it takes solid action and commitment to fight for fair pay and dignity at work. Fast food workers are showing this, OUR Walmart workers are showing this, thousands of workers across the country are involved and fighting for their rights at this very moment. Thousands more, already organized are fighting hard to keep what they have fought so long to win, dignity and decent wages on the job. We salute all of you! We pland to keep finding and telling your stories throughout this coming year, through our next major festival in May of 2014 and making alliances with other new media and worker film festivals all around the world who want to keep telling this story of struggle and success against the corporate exploitation that aims to beat workers down every day. History is on our side.